As you may or may not know, Fraser Surrey Docks wants to build a full coal port on the Fraser River, directly across from the Quay. The coal facility would eventually move ~8 million tonnes of thermal coal from the U.S. to power plants overseas every year. This is nearly a doubling of the amount of American thermal coal shipped through B.C. ports. A coal port across from the Quay would not only be an eyesore in an important tourist destination (and a place many New West residents visit daily for recreation), but it will also contribute significantly to global climate change and local air pollution. Exporting coal overseas while attempting to meet province-wide climate targets is duplicitous and hypocritical. Health concerns about breathing in toxic coal dust and diesel fumes are serious and real. Vulnerable groups like kids and seniors spend time on the Quay everyday (including mine, pictured above). The Fraser and Vancouver Coastal Health Authorities and the province’s chief medical officer have all called for a comprehensive health impact assessment, but it hasn’t happened to date. There is no benefit to BC from this coal port aside from maybe a few dozen jobs. If approved, our communities would bear the health and environmental risk while the profits will accrue to the US companies that own the mines, rail companies and Fraser Surrey Docks. On top of that, it’s likely to become a stranded asset: demand for imported coal in China is tanking as the country is getting serious about cutting down on pollution from coal-fired power plants. 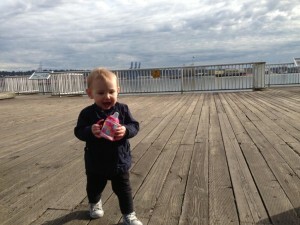 My objection isn’t just a knee-jerk NIMBY response as a parent who lives in downtown New West. I don’t think this coal port should be built in anyone’s backyard. We should not be making any investments in fossil fuel infrastructure. If we start building now, Canada could get 100% of our energy from renewable resources by 2035. As a parent, I think opposing this coal plant is just as important as the decisions I will make about where to put our kid into daycare. The more fossil fuels we let burn, the more different our kid’s future will be, and the evidence is strong that that future will be worse. Despite local opposition and lacking a proper assessment, the proposal so far has the approval of Port Metro Vancouver, an unaccountable decision-making authority with no local representation. But the Fraser Surrey Docks still needs additional permits before operating, so all is not lost. Our City, at least, recognizes the coal port is not in the interest of New Westminster (or any community). New West City council officially opposes the proposal and has signed on as intervenors in a court challenge. Ecojustice is taking Port Metro Vancouver to court on the grounds of procedural fairness and failure to consider climate impact. The Lamb on the Quay boardwalk. Photo: Laura Schneider. The other day I noticed a bunch of Canadian geese down at the Fraser River Styrofoam patch. Why, I wondered, would they prefer to toddle here rather than fly south for the winter? More importantly, I wondered why was no one cleaning this mess up. The area in question is home to a bunch of stray logs that get jammed into a small grassy, muddy alcove making it a perfect catchall for all kinds of debris. These logs, which look natural and quite fetching tangle themselves up with those nasties; large pieces of Styrofoam, their offspring chunks and worst of all those pellet sized eggballs that are near impossible to pick up. 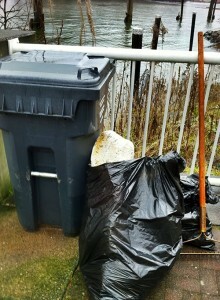 I think we all know that Styrofoam is bad and unsightly on our shoreline, but why is it so bad? Well aside from those crumbling little eggballs that birds and other wildlife seem to find so tasty and then get sick from because it blocks their digestive system which ultimately causes starvation, new research shows that contrary to popular belief, plastic and its chemically gassy, blown-up sibling Styrofoam may actually be breaking down in as little as one year, if the conditions are right. So the good news is that plastics may be breaking down in no time; the bad news is that these plastics may be releasing all their unpronounceable and potentially toxic chemicals in to our water system a whole lot sooner than we thought. Well thank goodness none of us drink from the Fraser. Garbage bagged in a one-person, one-day cleanup at the Quay included about 15 pounds of waterlogged Styrofoam, plastic and glass bottles, cigarette butts, newspapers, a mountain dew box, plastic bags, rope, drink caps, tampon applicators, both paper and plastic, tons of those little wrappers that cover mints you get when you leave the Boat House and, oddly, a coconut. Photo: Laura Schneider. And as an aside… why don’t we recycle Styrofoam? As it turns out, no one wants to. Apparently, it can’t be made into much except plastic lunch trays and packing material and it costs a lot to do that. Additionally, the pollution generated by making these lunch trays etc. is far more than making them from scratch. So anyway, back to the garbage patch that my dog Lamb and I have been walking past for years. It’s interesting because it changes. I’ve seen some really big stuff in there. I once crawled down to investigate an industrial cooler that was about three quarters the size of a refrigerator. My mischievous self wondered if wasn’t big enough to contain a body or some other nastiness. Anyway this stuff does occasionally appear and surprisingly disappear, but not often enough for my liking. So today I put on my boots, a warm winter coat and red rubber gloves. I grabbed my rake, garbage bags and the Lamb and off we went to clean the mess up. Lamb in tow, I tossed her over the rail, in order that she may have a good spot for supervising. The idea being that if I fell in or hurt myself she’d sound the alarm. Once down there you become aware that it isn’t just Styrofoam, it’s all kinds of stuff. And in keeping with the recent Queensborough Shoreline Clean Up initiative held this past September, I think that it’s really important we document my findings. Here is a list of what I found: lots of Styrofoam, about 15 water logged pounds worth, plastic and glass bottles, some of which were alcoholic and surprisingly still contained remnants inside, cigarette butts, newspapers, a mountain dew box, plastic bags, rope, drink caps, tampon applicators, both paper and plastic, tons of those little wrappers that cover mints you get when you leave the Boat House and of all things a coconut, which I left there. The interesting thing is that many of these items start to look like natural detritus, which I think, is a plus, to some degree. A while back I was in Hawaii taking pictures of shoreline garbage, which is virtually unnoticeable until you get close. In part because wave erosion, salt and sun convert it to look like everything else in the environment. What a coup. Again, back to the Quay… so a few people walked by and asked what I was up to, in fact, one person took photographs, as if this was something amazing or covert. I explained that I was taking half an hour out of my day and putting it toward my own personal community initiative. I was going to pick up garbage and report my findings. In closing, I would like to challenge all New Westmintonians to make their own community initiative. Find something to do that gives back to the community and report back. I’d love to hear from you. People looking down to the Fraser River from the West End and enjoying beautiful views from the River Walk at Port Royal or the Esplanade at Westminster Quay always notice the cottonwood trees growing tall and wild on Poplar Island. It appears untouched by anyone, but it actually has a long history. Many things, people and struggles have lived for 150 years on or about the unique island. 150 years ago, when the Royal Engineers first arrived in what was to become New Westminster, they found a strong community that had successfully been living here for thousands of years. To establish the new colonial capital Col. Richard Moody chose to segregate these people, known as the “New Westminster Indian Band” by Col. Moody and now the “Qayqayt”, to one of 3 places called “rancheries” . One of the rancheries was located on a small island on the North Arm of the Fraser River just downstream of the new community. Col. Moody named it Poplar Island for the trees that grew on it. The Colonial Government maintained this and many other rancheries as reservations until B.C. joined Canada in 1871. The reservations were then turned over to the administration of the Federal Dominion of Canada. Unfortunately, with the European settlers in B.C. (and throughout North America) came diseases such as smallpox causing several epidemics that affected the native population. As settlement spread up the Fraser River an epidemic occurred in 1889. Because it was not connected to any other part of New Westminster, Poplar Island was chosen as a place to quarantine smallpox victims. In July, New Westminster Mayor John Hendry reported to council that “prompt steps had been taken to prevent the spread” and that a “good hospital had been created on Poplar Island to which patients as far as known had been removed” (City Minutes-July, 1889). $100 was spent to build the hospital. It is believed that many native people from around Vancouver were transported to Poplar Island during the epidemic and many may have been buried there. Because of its association with smallpox, most residents of New Westminster looked sadly upon Poplar Island and it was ignored and became uninhabited for a number of years. During the First World War, a place was needed to build War Ships in New Westminster. Most of the waterfront was already used for mills and shipping, so New Westminster Construction and Engineering was founded in 1917 and within a month, they had totally cleared Poplar Island, built a rough foot bridge across from the foot of 14th Street and built a working shipyard for the Imperial Munitions Board. Four warships were built in the next year and launched from Poplar Island. About 600 workers earned $4-10 daily and built some more coal carriers for France shortly after the war. Because the island easily flooded, not much more work was done to continue industrializing it. From Port Royal and the Quay today, part of the dock where the ships were all launched from can still be seen at the Eastern end of Poplar Island. A Fisheries warden lived on the island but in 1940, the city zoned Poplar Island for industrial use and the city bought it in 1945. Not many ideas came up, so in 1948 the city sold the entire Island for $20,000 to Rayonier Canada Forestry. For about 50 years tall trees grew back on the island as big booms of logs were anchored around it while they waited to be processed at the lumber and paper mills around Poplar Island. Much discussion about what the use of it might be and native land claims were discussed and so Western Forest Products sold the Island back to the Province of British Columbia in 1995 to be preserved. Not much more has been done to decide how to use Poplar Island because of its history. It is now the only large Island on the North Arm of the Fraser that remains without dikes. It was suggested as a connection point for a pedestrian bridge between Port Royal and Downtown without decision a few years ago, homeless people took up residence about 5 years ago for a while and treaty negotiations have continued. Poplar Island is now mainly a place that people look upon in contrast to all the busy and rapidly changing places that surround it. From time to time, the City of New Westminster sends us a press release that we think are worth sharing – yet we don’t always have the time to follow up with a post. We’d link to them … if only we could find a copy online! As a new feature on Tenth to the Fraser, when we get a media release from the city that we think you’d like to know about, we’ll share it here so you can be among the first to know. If you see a press release come through that you’d like to write a follow-up guest post about, please drop us a line. You are, of course, always welcome to share your thoughts in the comments, on Facebook or via Twitter as well! – Briana. 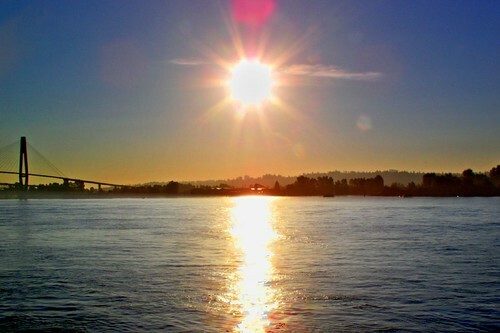 New Westminster, BC – The City of New Westminster has secured nearly $22 million in funding under the Build Canada Fund, administered by the federal government and Province of British Columbia. Projects earmarked for funding include the Westminster Pier Park ($8.3 million from each level of government) and streets and sidewalk revitalization ($2.66 million from each level of government). “Our new Westminster Pier Park will become an integral part of the “Experience the Fraser” project that will see a world class trail and park system connect communities along the mighty Fraser River,” the Mayor added. Both projects were advanced as part of the Build Canada Fund, established to help British Columbia communities meet their pressing infrastructure needs, stimulate the economy, create jobs and support continued economic growth. Next steps include completing the technical and design work relating to each project and, in the case of Westminster Pier Park, completing an environmental remediation plan once a final design has been achieved. In the coming weeks, a public consultation will commence to solicit input from city residents on what they would like to see in the Royal City’s new waterfront park. Construction will commence as soon as possible for both projects with completion scheduled for 2011. New Westminster Record: Is it safe? 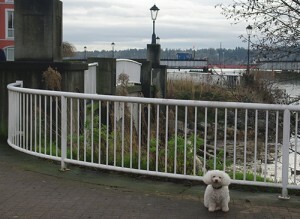 The Brunette-Fraser Regional Greenway – Sapperton Landing is a clumsy moniker for a little stretch of park that runs west from the mouth of the Brunette River until it runs out of space a little less than a kilometer away. The Greenway will eventually connect Vancouver with New Westminster with a bike and pedestrian pathway. Chunks have already been built, and this is one of them. As such, it has two paths: one paved (for bikes), and the other gravel (for sneakers). It’s very flat and there are a few observation decks that allow the tired or bored to lean out over the Fraser River and try to count the squashed cars being loaded onto barges in Surrey. The park is a study in contrasts: squashed between the working Fraser and the railway, with the Skytrain almost directly overhead and the busy industrial thorough-fare Front street just beyond, it still succeeds in providing a pleasant amble through greenery. Plants, as is carefully laid out on several didactic posts, are “left to grow naturally”, in an attempt to create many wildlife habitats. Presumably someone weeds out the invasives like loosestrife and himalayan blackberry to keep it natural to this area. The brush is trimmed that abuts on the paths making it almost seem manicured. For wildlife in May I noted several spotted towees and a lot of sparrows that moved too quickly for me to figure out what kind. Access to Sapperton Landing is difficult. By car the only way is a right turn onto Cumblerland from Columbia Street. Cross two sets of tracks and watch out! The road is only one lane. Parking is several hundred metres from the entrance, behind what I think was a customs house. Sapperton is the closest SkyTrain station. By the mouth of the Brunette is an old government wharf with a few fishing boats, and a lot of warning signs. At the other end, the trail ends suddenly where there’s no more land. A dumpster keeps you from sauntering onto Front Street. When the rest of the Greenway is completed you’ll be able to walk or bike to Vancouver along the Brunette River, or to the New Westminster Quay if you go the other way. Right now, however, if you don’t feel like risking Front street you have to turn back and admire the graffitti on the berm past the tracks. Walking one way and back with a small dog and surly teenager took about 40 minutes, with pauses to take the occasional photo. Sapperton Landing is important historically: this is where the Royal Engineers made their camp, where prisoners for the penitentiary were unloaded, and where the colony of BC was governed. Actually that was probably up the hill a bit, but this is probably where they sat down at the end of a long day, swung their bare feet into the water and smoked a pipe. Sapperton Landing (The Brunette-Fraser Regional Greenway) is a pleasant stroll today, but will probably be amazing once it’s connected to the rest of the system.